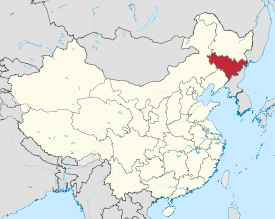 frae girin ula, a Manchu phrase meanin "alang the river"
Jilin (Cheenese: 吉林; pinyin: Jílín; Wade–Giles: Chi-lin, IPA: [tɕǐlǐn] ( listen); Postal map spellin: Kirin), is a province o the Fowkrepublic o Cheenae locatit in the northeastren pairt o the kintra. The name wis transliteratit tae Kirin afore staundartisation tae pinyin. The name "Jilin" probably oreeginates frae Girin ula ᡤᡳ᠍ᡵᡳ᠌ᠨ ᡠᠯᠠ, a Manchu term meanin "alang the river"; this wis transcribed intae Jilin wula (T: 吉林烏拉 / S: 吉林乌拉) in Cheenese, then shortened tae Jilin. The leeteral meanin o the Cheenese characters for "Jilin" is "auspicious forest". Wikimedia Commons haes media relatit tae Jilin.